Baccarat is perhaps one of the easiest casino games to play and learn. Each player needs to only place a wager on the Player hand or Banker hand. Two cards are dealt for each hand, with the option of drawing an additional card. The object of the game is to reach the point value closest to 9. Player also has the option to bet that the two hands will tie. In EZ Baccarat, two popular side bets called Panda 8 and Dragon 7 add excitement to this game. The Panda 8 is a side bet when the Player hand wins with a three card total of 8. The Dragon 7 is a side bet when the Banker hand wins with a three card total of 7. Pai Gow Poker is a Poker game with a twist. Using one deck of 53 cards (containing one joker), seven cards are dealt to seven hands. The object of the game is to create the two best poker hands. Each seven card hand is divided into a two card hand and a five card hand. The five card hand must have a higher poker rank than the two card hand. After the Player/Banker hand is set, it is then compared to each player hand to determine the winner. The Lucky Bonus wager is a bet that your seven cards will make a bonus qualifying hand, regardless of how you set your Pai Gow Poker hand. Blackjack X is a version of California Blackjack. A Blackjack X hand is when the first two cards that are dealt are a suited Ace and King. The game feels familiar, but with new ways to win and additional bonus bets. 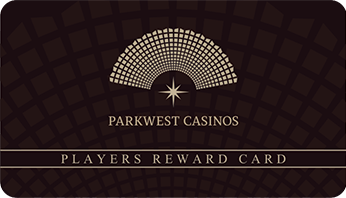 At Parkwest Casino Sonoma we offer an eight deck shoe game, a five deck continuous shuffler game as well as double deck Blackjack. If a player wagers on the Bam Bonus bet they will be paid out according to how many cards it takes the dealer to bust. Get dealt a pair with your first two cards and win! 3 Card Poker is a spin on regular Poker. Players are given three cards to play. The objective of the game is to compare your three card hand against the Player/Banker three card hand. The hand with the highest value wins. The game also features bonus bets to give you more ways to win! Because hands only consist of three cards the hand rankings are a little different than with a traditional five card hand. The Pair & Up Bonus wager is based only on whether your three card hand has a Pair or higher. If your hand has a pair or better you will win if you have a wager on the Pair & Up Bonus spot. The Bonus 6 considers the three cards dealt to the player’s hand and the three cards dealt to the Player/Banker’s hand to make the best possible poker hand. If your hand and the Player/Banker hand create at least a three of a kind or better, you will win if you have a wager on the Bonus 6 spot. Texas Hold’Em Poker is the most well-known version of Poker played around the world. Players are given two cards and play with five community cards to try to make the best hand possible. The goal of the Texas Hold’Em Poker is to win the betting pool or pot with the highest ranking five-card poker hand attainable out of the seven cards available. In Omaha Hi/Low, every player receives four cards and the pot is split between a High hand and a Low hand. If there is no Low hand possible, the best High hand wins the whole pot. In Big O, ever player receives five cards and the pot is split between a High hand and a Low hand.